Heartfelt piano compositions, lightly orchestrated with emotional and ethereal strings. Familiar if you love the music of artists like Ludovico Einaudi or movie theme composers like Thomas Newman and John Barry. I am always inspired by themes of nature, love and spirituality, so I expect this shows in my instrumental compositions. My hope is for all my music to be relaxing enough to calm a racing mind, yet exciting enough to induce creativity. 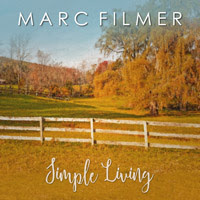 Hi, I’m Marc Filmer, a pianist and composer and I’m pleased to announce the release of my new EP, entitled ‘Simple Living’. I’m a British born creative, now a naturalized US citizen, residing in Upstate New York and I’ve provided music to major clients, networks and agencies. As a listener, I’m inspired by neo-romantic movie themes by composers like John Williams, John Barry and James Horner. I’m fond of instrumental music by Artists like Enya and I follow a similar philosophy of avoiding click-tracks in favor of a humanistic ebb and flow. Sign-up for my ‘New Album Release’ emails and receive the title track of ‘Simple Living’ for free, plus others. I plan on continuing to provide a free track from each new album to my subscribers while I build my fan list. Thank-you for your interest… now please lend me your ears!